Congrats to Adam C. of Brookline, New Hampshire who just won a $25.00 Restaurant.com gift code for writing a review for Long Range WiFi Bridge System to Extend Internet Access at 3Gstore.com! Every week we randomly pick one product review from the previous week and award the writer a $25.00 gift code. We appreciate ALL the reviews our customers write, whether they are positive or negative - honest reviews like Adam C.\'s help other customers decide if the product is right for them. After you purchase a product from 3Gstore.com, we encourage you to log in and 3Gstore.com and leave a review letting people know how the product worked for you - you'll be helping others, and you'll automatically be entered to win a restaurant.com gift code!. I have only had this product in production for about 3 weeks. 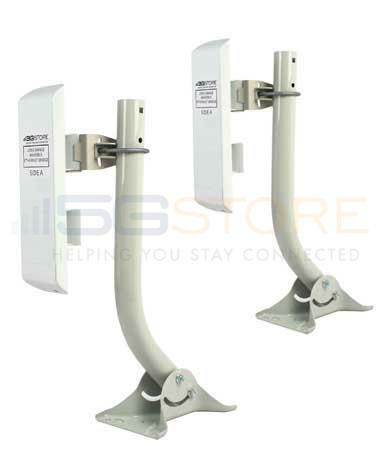 The product shipped with two mounting systems which was great. It was pretty much plug and play. I am not bridging a large distance but the speed is across the bridge is excellent. The only issue I have is that the antennas are mounted up high and the location of status lights are at the top of the antenna so I cannot just glance up and see the current status. Also they are almost impossible to see in direct light. It would be good if the lights were located on the bottom or if you could access a web interface to view the status. Maybe they do have a web interface and I am not aware of it. So far I am very happy.